A recent compositional study of Egyptian cobalt-blue glass from museum collections in Japan (18th Dynasty) and from the site of Dahshur (18th and 19th-20th Dynasties) concluded that a new source of cobalt was exploited for the later Dahshur glass, thereby suggesting that glass production continued into the Ramesside period (Abe et al. 2012). It is shown in the current article that some of this 18th Dynasty glass and the majority of the 19th-20th Dynasty glass had been recycled, not only supporting the general consensus that glass production virtually disappeared by 1250 BC, but that the cobalt source did not necessarily change. It is further proposed, however, that the generally accepted cobalt source for Egyptian glass was not the alum deposits of Egypt's Western Desert, but derived from cobaltiferous siliceous ores, possibly from central Iran. 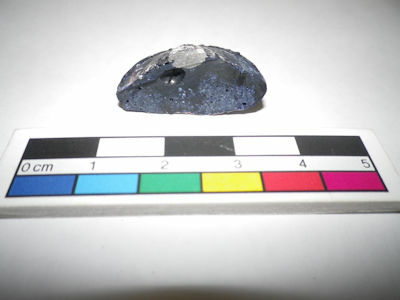 Re-analysis of the compositions of cobalt-blue glass frit found at Amarna, as well as Egyptian and Mesopotamian glass, suggests that the cobalt colourant was a by-product of silver extraction from these ores and can therefore be considered as a concentrated cobalt glass slag, which travelled in the form of a frit to glass producers who added it to locally derived base glasses and/or their precursors. Experiments conducted on ore containing cobalt-nickel arsenides with native silver demonstrate that not only can silver be extracted and that concentrated cobalt glass can be produced simply by adding a flux, but that some components of the ore partition preferentially into the silver or the glass slag, thereby weakening their associations with the other components in archaeological glass. Treating the cobalt-blue colourant as a slag composed of the gangue of a smelting system provides an explanation for the unique elevated levels of alumina and lower levels of potash found in cobalt-blue glasses, as well as providing an explanation for the cessation of cobalt exploitation at the end of the Late Bronze Age. It is suggested that the exhaustion of native silver and siliceous silver ore deposits during the Bronze Age, with argentiferous lead ores becoming the main source of silver, depleted the amount of cobalt available, thereby reducing the amount of glass produced which, in turn, led to increases in recycling during the New Kingdom period.